There’s certain Brighton venues that will always strike a chord in me after living in this city for over a decade. One of these is Hotel Du Vin, which stands in all it’s gothic glory at the end of Ship Street opposite the seafront. Thinking back, most times I’ve frequented the hotel has been for an occasion. Celebrating handing in my dissertation with cocktails, celebrating friend’s birthdays with cocktails, celebrating finishing work for Christmas… you got it – with cocktails. There’s definitely a running theme going on here and I’m ok with that. One thing I had never done however is eaten dinner at Hotel Du Vin Brighton, or Bistro Du Vin to be precise. 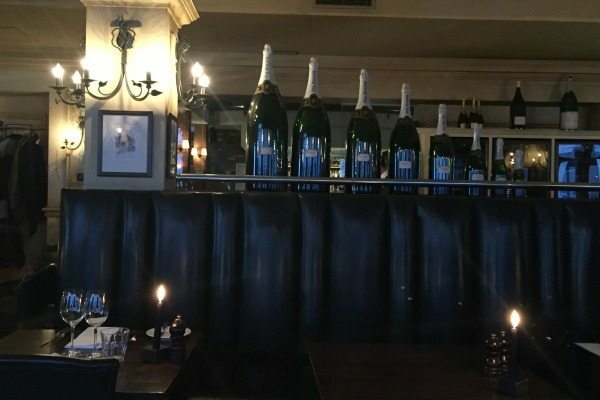 Located next to the large bar the bistro is decked out in traditional french decor; think leather banquette seating, soft lighting, brass features and plenty of champagne magnums on display. As soon as we arrived we were whisked off to our table by our waiter, Simone who was a real Frenchman (tick!) and oozed all the charm and finesse that the French are known for. It happened to be my boyfriend’s birthday and we decided to push the boat out and go for steak and red wine to celebrate. But first there was the starters to deliberate over. The spring menu had just been launched and there was a lovely theme of light dishes to choose from. 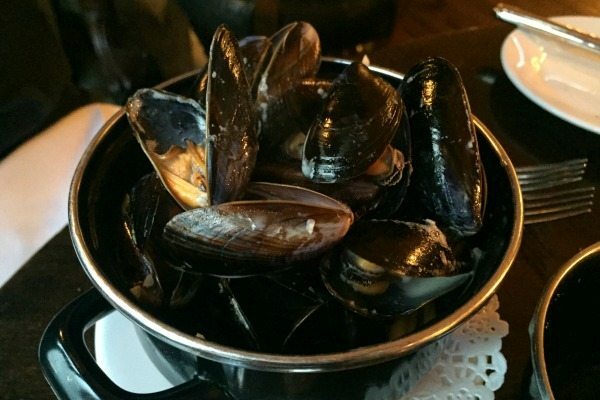 Tom went for moules marinière, a classic French dish of mussels steamed with white wine, cream, shallots and garlic. It came served with a lemon encased in cheesecloth to catch the pips (très bien) and smelt divine. 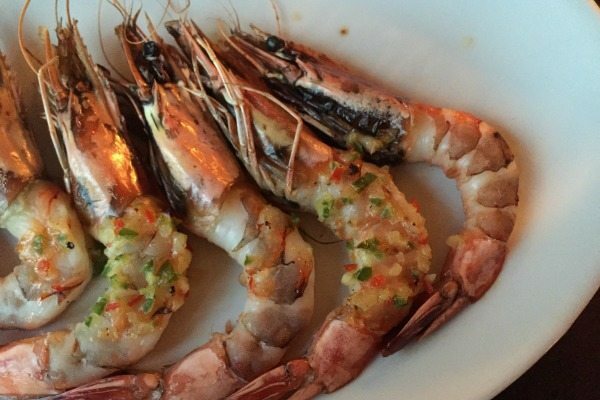 I went for the roasted tiger prawns with pastis (an anise-based spirit) and chilli butter. Unfortunately these were a little disappointing as the prawns were a on the soft side and lacked the bite you would expect. The sauce however was great and I mopped it up with the freshly baked bread that we had been given on arrival. In terms of wine, we went for a carafe (500ml) of the Australian Pinot Noir – smooth, silky and full of berry flavours. This is where the Bistro really comes into it’s own, with a huge selection of wines and an amazing cavernous wine cellar to boot (ask for a tour when you go). 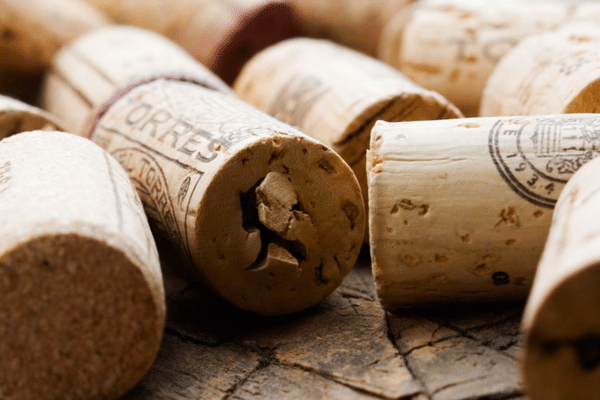 The bar offers wine tasting evenings and even runs courses for those wanting to get past the sip/swirl/spit stage and learn about how wines are made. I could talk about wine all day but I might drive you to the bottle (and not in a good way). The waiters at the Bistro understand that this is occasion dining for most people and give you the time and space needed to enjoy your meal without rushing you through courses. This is important to me, especially when you are out for a celebration and want to savour the evening. Our mains courses swept out of the kitchen and were presented with a flourish by Simone. 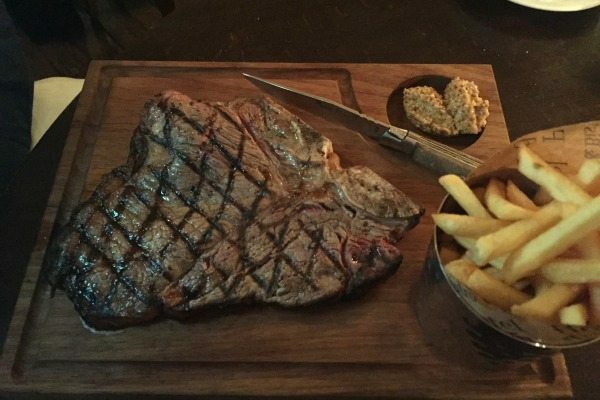 I had gone for the fillet steak (250g) with a garlic butter sauce and haricots verts a la niçoise, and Tom had the porterhouse steak (a hefty 500g!) with sautéed spinach. Both steaks came served with fries but sides were extra. Presentation was simple and attractive, but in terms of flavour the porterhouse won hands down! The porterhouse is a cut from the rear end of the short loin for a larger portion of tenderloin and had a delicious chargrilled taste and tender texture. 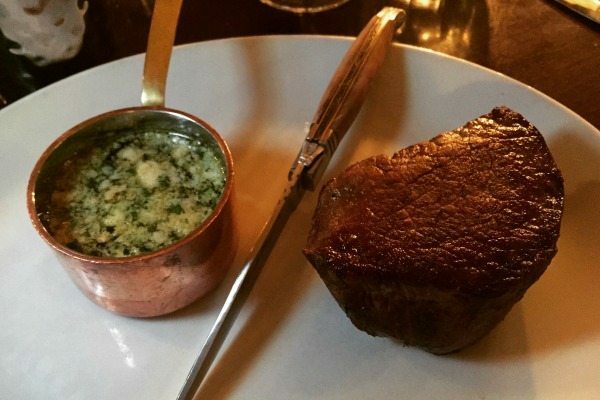 The fillet was also very good but lacked the depth of flavour that the porterhouse had and was the more expensive dish. I’ll know for next time! After a quick look in the wine cellar downstairs we decided that perhaps it was best to curb our gluttony and skip dessert. But non! 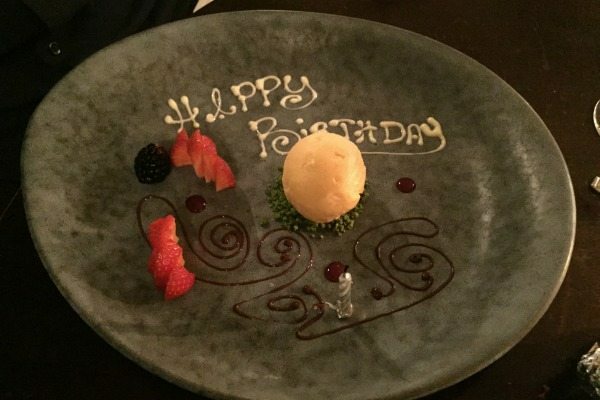 The waiting staff had taken note of it being Tom’s birthday (I had mentioned it when booking) and out came a special birthday dessert of sorbet and pistachio crumble (sans singing I hasten to add). It doesn’t matter how ancient you get, a birthday dessert is always a delight and Tom was chuffed to bits. And thus ended a wonderful evening. 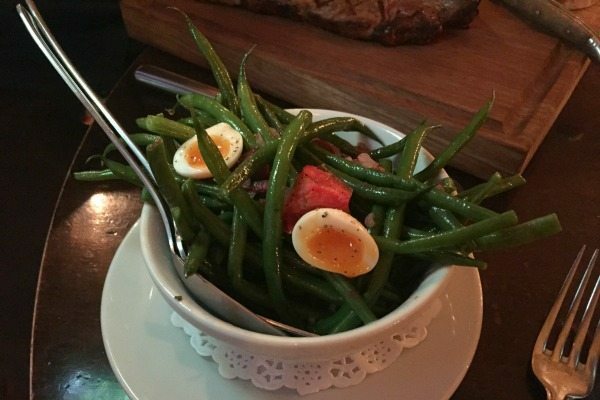 It was like a French version of Downtown Abbey dining, with all the glorious ponce and flair that Hotel Du Vin does so well. I must mention that the Bistro offers a fantastic set menu Monday – Thursday which includes 2 courses for £16.95 or 3 courses for £19.95 with a complimentary glass of house wine for those dining before 7pm.